‘We are really trying to give our children opportunities for engaging in additional physical activity every day. Of course, following our Run to Rio success, we are still doing our daily mile, but wanted an alternative option. 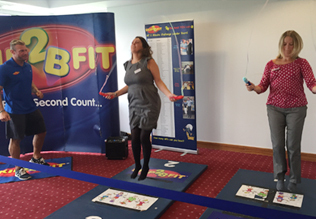 We found Skip2BFit and they are fab - we've just had 2 days of workshops which are very motivating for the children and easy for staff. I didn't know if you had heard of them before? are selling well and skipping mania has taken over in the playground. "Just had John in for his workshop today- he was fantastic. Full of enthusiam and the children really gelled with him ( although I think the reception children were a little bewildered at times). I don't know where he gets his energy from but it was quite infectious ! We are planning to use the Skip2Bfit counting skipping ropes next week in our maths lesson to teach mean, mode, median and the range of the number of skips, so wish us luck." Thorngrove Primary school , Bishops Stortford. "Just a quick email to say what a great day we had with Skip2Bfit on Monday. 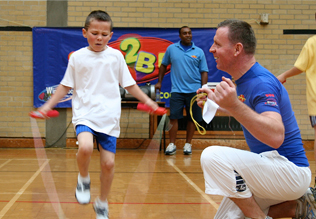 John delivered each session with fantastic enthusiasm and motivation and his passion for skipping was infectious. The staff at Northgate are now starting a skipBbfit challenge every Thursday after school - we're all determined to beat our personal best!. The skip2bfit kit bag is being used by everyone and the children want a dedicated skipping area in the playground and everyone is fully on board with the whole concept. Just wanted to let you know how fantastic our Skip2Bfit day was. John was really on form and delivered exciting full of energy sessions to Reception class right through to Year 6. The children (and staff!) thoroughly enjoyed it are definitely captured by the challenge! I am hoping we will be able to book Box2Bfit in the Summer term. 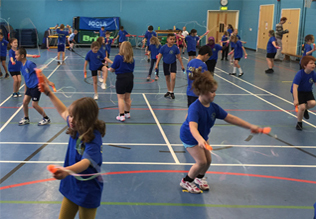 Thankyou to the partnership for funding this really worthwhile day, it has brought attention to how effective skipping is for health and fitness and of course how much FUN it is! Apologies for the email out of the blue but my name is Emily and my son is Harrison ...... ( Name supplied) and attends Bridge and Patrixbourne C of E Primary School just outside Canterbury. Last year Skip 2 B Fit provided the children with a skipping workshop and i just wanted to write to express my thanks. I've just been chatting to Kay .... one of Harrison's old teaching assistants and she mentioned that you had asked after Harrison which prompted my email. I have to say talk about a dog with a bone! that skipping rope got some serious use that weekend and has done very regularly since. He is a skipping demon now, by then end of that week he had well and truly cracked it (if only he took to reading with such enthusiasm!). Thank you for introducing something, which i am ashamed to say that despite owning myself at his age, i hadn't considered getting for him. He has taken it to his football club, he takes it on our walks (now skips) into town, he still takes it to school now and again and has demoed his skills to anyone who will watch. I have rarely seen such determination and i am sure it's due to your encouragement and teaching so thank you. thank you for my skipping rope. I can do 999 skips. See out Twitter feed for some great tweets and videos.